The Sect - Ready Steady Gone! In the sixties there weren’t many Newcastle bands that made it to the top. After the Animals in 1964, there was a long gap of 6 years before Lindisfarne achieved chart success with their second album, ‘Fog On The Tyne’. Lots of individual musicians from the Newcastle area have found fame and fortune but famous Newcastle bands were thin on the ground. That’s not to say that there weren’t good north east bands around in the sixties that deserved to make the big time or, indeed, tried to make a go of it. After the Junco Partners took over the Animals residency at Newcastle’s Club a’Gogo, a lot of people expected them to achieve the same success as their predecessors and be the next band from the city to hit the charts. Then there was the Sect. Bands that make it to the top usually have more than just musical ability. They often have at least a couple of members with charisma and good looks. Back in 1964 and 1965, Newcastle band, the Sect had their fair share of both. The band built up a great reputation in the north east and had a large following of mainly female fans. They played at the best venues in the city, such as the Mayfair, Majestic, Club a’Gogo and the Quay Club. 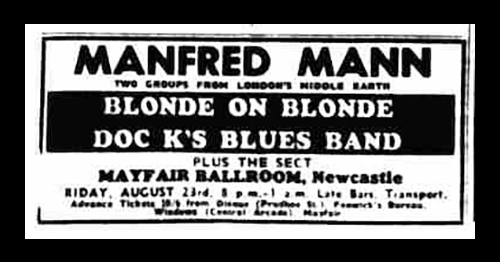 They also played at the el Cubana and Blue Note in Sunderland, the Cellar Club in South Shields plus other venues all over Northumberland and County Durham. The roots of the Sect lay in a band formed in 1963 by guitarists Alan Atkinson and Steve Gatiss plus bass player Dave Stubbington. Mel Mason (vocals) and Ian Pringle (drums) joined the lineup and the band started performing under the name of Tony King and the Chessmen. After a while, Mel left leaving the band to continue as the Chessmen. The band had a busy schedule playing all over the north east, sometimes doing 5 or 6 booking a week. In 1965 the Chessmen became the Sect. Later that year there were several changes to the lineup including the departure of drummers Ian Pringle, his replacement Dave Burn and bassist Dave Stubbington. The next Sect lineup was – Brian Short (vocals), Alan Atkinson (rhythm guitar), Steve Gatiss (lead guitar), Tom Duffy (bass) and Dave Corker (drums). Unlike the Junco Partners who played mainly blues based material, the Sect were a bit more mainstream. They covered music that was good to dance to and that was popular in the clubs and ballrooms. A few songs I can remember them doing were; Land Of A Thousand Dances, The Way You Do The Things You Do and It’s All Over Now Baby Blue. The Sect got their shot at fame and fortune in 1966 when songwriter and producer Tim Rice saw the band performing in the north east. The band was invited to a recording session at the Abbey Road Studios in London by Tim Rice who, at the time, was a producer for EMI. They recorded an upbeat version of Bob Dylan’s ‘It’s All Over Now Baby Blue’ and ‘Walk Away Renee’ which had been written and recorded by the American band the Left Banke a year earlier but had not charted in the UK. In the event, neither track was released by EMI. Around about the same time, the Sect came to the attention of Ivan Birchall, the manager of the Majestic. The band had supported Unit Four Plus Two at the “Maj” and had impressed Ivan with their performance and the reaction they got from the crowd. This gig was followed by more at the Majestic supporting the likes of the Kinks, Hollies, Small Faces, Georgie Fame and many more. Ivan became the Sect’s manager and left the Rank Organisation to set up his own business in the city. The business became the Birchall Entertainments Agency. The Sect’s closest rival in terms of local popularity was another Newcastle band, the Elcort. The Elcort, who were also aiming for national recognition, released a record on Parlaphone in 1966 – ‘Tammy’ and played several gigs at London’s Marquee club. The band was fronted by Glyn Sadler and included a couple of other well known north east musicians, Kenny Craddock (keyboard) and Paul Nichols (drums). In 1967 Brian Short left the Sect to form a band called New Religion with Kenny and Paul from the Elcort. The effect of this move was that a number of bands on the books of the Birchall Entertainments Agency, including the Sect and the Elcort, disbanded or reshuffled their personnel and reformed with new identities. The new Birchall ‘A’ list bands to emerge from the melting pot were the New Religion, Funny Farm, Pleasure Machine and with their name unaltered but with different personnel (including Glyn Sadler from the Elcort) – the Sect. After New Religion, vocalist Brian Short went on to join London based Black Cat Bones, whose line up had included Paul Kossoff and Simon Kirke before they left and joined Free in 1968. Brian sang on the band’s 1969 album ‘Barbed Wire Sandwich’ which was released on the Decca Nova label in November 1969. After Black cat Bones split up, Brian recorded his solo album ‘Anything for a laugh’. In spite of some excellent songs and a memorable title track, ‘Anything for a laugh’ failed to win critical acclaim and Brian never achieved national recognition. The Sect continued to perform locally for another four or five years with the odd change in personnel. Although some individual members went on to successful careers in music, the Sect never quite made it on a national level as a band. However, they continue to be one of the best remembered bands to have performed in the north east music scene in the sixties. the pic above of Eddie Martin shows me on drums with the Sect 70-73 after which I left to join Sandgate. 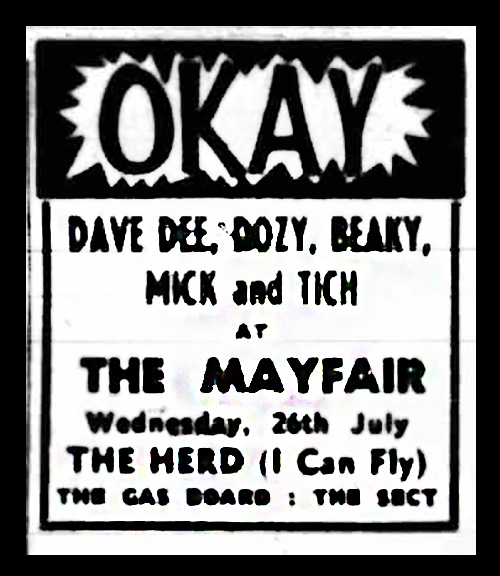 The Sect I was i had Eddie Martin, Derek "Dek" Rootham and Alan Atkinson until Dek left the band leaving the three of us to carry on. Hi this is Steve Gatiss's brother writing. Would you have any idea where I might be able to get a copy of the video taken at the Sect's reunion at the Old Assembly Rooms in Newcastle a couple of years back. Many thanks. I may be biased but I've yet to hear a group pro or amature in the same class as the Sect. This brings back such memories. I played bass and did vocals for The Sect back in the early 60s. We formed the original band comprising Alan Atkinson, Steve Gatiss, Mel Mason, Ian Pringle and me. We were then called Tony King & The Chessmen. We played all over the North East, mainly in working mens clubs but we did other venues such as The Seaburn Hall. Mel left and we became The Chessmen. Ian then left and Dave Burn became our drummer. Sometime later we changed our name to The Sect and Phil Gatiss became our manager. I left to become a boring insurance guy and later to get married. I unfortunately lost touch with all the lads and in 1974 I moved to Manchester. I still have great memories of playing and in fact I still have an old demo disc we did in a studio in Newcastle. The first band I was ever in was with Steve Gatiss and a few years later I met up with him again in Scratchband - anybody know how he is now! Hello I am sitting having a pint with steve gatiss glad to say he is alive and well. Just a note to say that Eddie Martin is none too well at the moment but it would be good to have a memorial to the Sect and/or to the great Burlesque on the Quayside on the new walk of fame or whatever it is called. Saw it on the Northern News today. Also to Paul Rutherford who was a fantastic bass guitarist and vocalist in the 70s with Burlesque and who died tragically young. There must be so many people out there who remember them and would love to see a memorial to the great music of the 70s ad 80s and to local guys who never quite made it but gave so much pleasure to the local scene for so many years. The Photo of Eddie (this page)that's me in back on drums. We were at the Milvane club, west road, Ncle. Looks like it anyway. Oh, and Eddie isn't well, so he told me last week as it happens. They had the aisles rocking. I was in a band with Glyn Saddler and Kenny Craddock in a band called The Heatwave before they left to join The Elcort. A great read. Brings back memories of the Sect coming to the Legion Dance Hall in Amble. I was talking to Steve Gatiss 14/04/18. He is the con sec at Greencroft club next to QE Hospital Gateshead. What became of the Pleasure Machine?